Not long ago growing culinary herbs in a home garden was regarded as an eccentric thing to do and only the most adventuresome gardeners grew medicinal herbs. Things have changed and more gardeners than ever are growing herbs of all kinds. Seeds for medicinal herbs are readily available in catalogs and online stores making it easy to get started with medicinal herbs. There are plenty of books and online resources available for anyone interested in growing medicinal herbs but nothing can replace seeing it first hand. Over 40 percent of medicines are derived from plants. For a wonderful introduction to the world of medicinal herbs visit the Medicinal Garden at University of Michigan Matthaei Botanical Gardens. 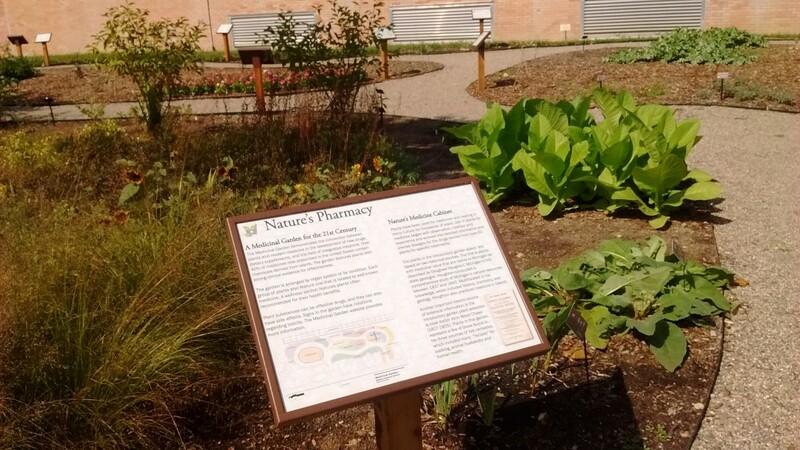 The folks at Matthaei have collaborated with the U of M College of Pharmacy to develop this garden. There you can see many different medicinal plants growing. The garden is not organized by genus and species as botanists like to do but rather by human body systems: respiratory, gastrointestinal, cardiovascular and more. 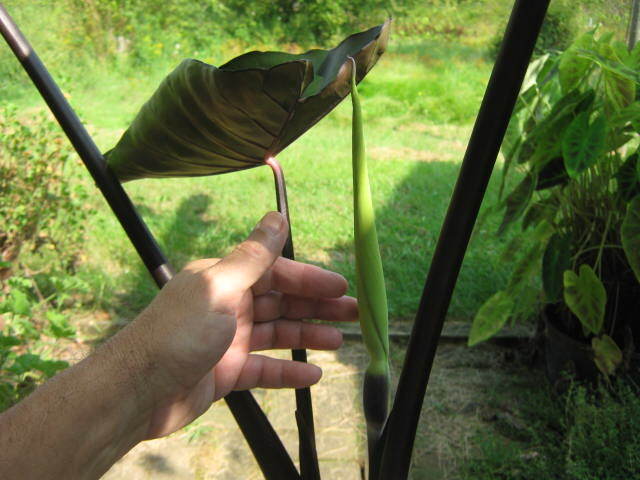 Other areas of the garden are devoted to disorders such as diabetes, infectious diseases, cancer, etc. Matthaei Botanical Gardens is located near Ann Arbor at 1800 North Dixboro Road, a half mile or so south of Plymouth Road. They’re open daily from 10 am to 8 pm during the summer season. This week while going through some items in a storage shed, I came across a beautiful dried ball of mud inside an antique trunk. It was the nest of a wasp known as a mud dauber. When we think of wasp nests, usually the first thing that comes to mind is the papery nest of the paper wasp or the football-shaped nest of hornets. Mud daubers build their nests out of mud. There is plenty of mud for the wasps this summer because of all the rain we been having. Mud daubers are not social insects like paper wasps and the others. Instead, they spend their lives as single, solitary insects. They do everything by themselves including, building a nest, laying eggs and collecting food for their young. There are many different species of mud daubers in Michigan, this one is called the “black and yellow mud dauber”. The adults look similar to the more common social wasps but are larger and have exaggerated features like the thread-like connection between their abdomen and thorax. The female mud dauber builds the nest by collecting mud along the edge of puddles. Using her mouth parts, she rolls the mud into a ball then lifts it into the air and carries it to the nesting site. There she adds the mud to her nest, building rooms or cells for her young. Each cell is big enough for one young mud dauber. While the female is away from the nest gathering mud or foraging for food, she temporarily closes the entrance to her nest to keep predators away from her young. During that time, the daubers are in the larval stage of their life cycle. The mosaic pattern on this mud dauber nest is from the different types of mud that the wasp collected. Here you can readily see that the entrance is open. The female mud dauber is working on expanding her nest. Note that the entrance is closed. So far, the nest is about four inches long. The female also packs away food for the developing larvae by placing insects or spiders into each cell so the larva has enough food in its cell to carry it through its growing stage. Some types of mud daubers — like the black and yellow — only prey on spiders while others prefer caterpillars or other insects. The prey is only for the young though. The adults feed on nectar, honeydew from aphids or other sugary liquids. Sometimes you can spot them sipping sugar water from hummingbird feeders. Unlike other wasps and hornets, mud daubers don’t defend their nests. They are not aggressive and rarely sting. Although if you try hard enough you can sometimes provoke one into stinging you. According to one university website, some species “sing” while building their nest! Mine didn’t seem to be in a singing mood when I found her. Another interesting behavior of mud dauber is their sleeping habits. They don’t sleep on their nest at night as you would expect. Instead, they fly each evening to the same protected area away from the nest and spend the night there snuggled under branches or leaves. They are generally considered beneficial insects because they eat other insects. You could argue that the spider-eaters are not very beneficial because spiders eat insects too — that is unless you hate spiders. Most of the time we don’t notice the daubers until they build a nest somewhere where we don’t want it. Some people destroy the nest as soon as they find them. There seems to be a small industry built around exterminating mud daubers and getting rid of their nests. I prefer to let leave them alone and let them go about their business.